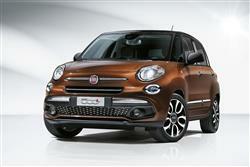 Fiat's surprisingly spacious 500L probably makes most sense in 1.3-litre Multijet diesel form. Jonathan Crouch looks at the improved version. The 500L for Large is Fiat's bold answer to customer and dealer demands for a grown up alternative to the small but so successful, 500. One that does the people and baggage carrying chores with a practical dash of Italian flair - allowing individual personalisation through extensive options that set new benchmarks for the class. Let's check the improved version of this car out in 1.3-litre Multijet diesel form. Back in 2013, following the smash hit impact of their retro 500 citycar model, Fiat knew the time was right to follow the path of the BMW MINI trailblazer and grow a family of derivatives. In reality it's a very big stretch to take the 500 theme and make it MPV-like but that hasn't stopped Fiat from trying. As with the MINI Countryman, Fiat's supermini-sized inspiration has been elongated to break through the 4-metre class barrier. Some fundamental construction changes were needed to deliver the load carrying capacity and full fat 5-passenger space expected in this challenging class but the resulting design is surprisingly spacious. One that features Citroen's versatile C3 Picasso, Ford's sliding doors B-Max, the Korean Kia-Hyundai Venga-ix20 duo and more. At least the under-bonnet stuff didn't need much work, with engineware largely carried over unchanged from other Fiat models. Take the 1.3-litre Multijet diesel of the variant we're going to look at here. Many UK buyers will. So what's the inside story? First impressions count and the near greenhouse glass areas and elevated driving position give a fine feeling of a superior driving environment coupled to outstanding forward vision. The cornering and handling are better than you would anticipate from this tall and comparatively narrow body. Body lean is restrained; Fiat engineers favour a firm a ride over our ever-bumpier byways. It is not uncomfortable, but neither is it restful. Our 500L did respond faster than most MPVs when it came to the steering though. This electrically-assisted steering system will not chat to you about what the front wheels do: echoing a valued employee, this Fiat just gets on and gets the job done efficiently, no fuss, but no entertaining banter either. The 1.3 MultiJet diesel of the version we tried has the least horsepower in the range at 85bhp and that makes it the slowest to whistle up 62mph - that process taking a tardy 13.9 seconds. This model also stumps along at the lowest maximum speed, just a breath beyond 100mph. But before you dismiss it on statistical grounds, remember that a 1.3 MultiJet also returns the best combined fuel consumption and lowest emissions of the range. Fiat's designers needed to offer their customers a product they could literally grow into and I think they've done a remarkable job. Expanding the 500 from cuddly baby to 500L adult started at floor level with a 312mm stretch in the wheelbase and a leap in length from 3546mm to 4147mm. Width went up by 157mm and the roof height was elevated a considerable 177mm. Of course 500L doesn't have the cute appeal of the smaller 500s, but what 500L does have in abundance is originality and ingenuity. For proof, look at the flow of the wraparound windscreen, giving almost 360-degree vision. This improved model has been lightly re-styled and now features LED daytime running lights. Plus the revised front bumper and a chromed-studded three-dimensional lower grille mesh now give the car a more elegant look. Inside, the instrument binnacle you view through the re-styled steering wheel has been re-designed too. Out back, the hatchback opens up conventionally to reveal a versatile interior with a claimed 1500 possible permutations of fittings, furniture and adjustability. There's between 343 and 400-litres of space available, depending on whether the sliding rear seats are pushed forward or back. Delivering much more requires merely a one-pull lever operation of the Fold & Tumble system that flattens the rear bench to cover a cargo area up to 2,400mm long. Up front is also a good place to be, laid out clearly and accompanied by neat 4-dial instruments with no gimmicks. All 500Ls have the useful safety and convenience feature of locating audio and voice command on the leather-rimmed wheel. 500L pricing starts at around the £16,000 mark, but you'll need at least around £18,000 for one of the 1.3-litre Multijet diesel models. Air conditioning, a UConnect multimedia system, cruise control, plus power windows and mirrors are standard on all models, as are twin front, side and curtain airbags. But it's the options list that really makes this car stand out, with no fewer than 100 or so individual items from which to choose. You can colour-co-ordinate the roof, the wheels - even the dashboard in line with your tastye, plus there are decal packs to make your car further stand out. Inside, a Beats by Dr Dre audio system will get your passengers foot-tapping and features 6-speakers and 8-inch sub-woofer. Plus there are all kinds of ways that you can upgrade the UConnect multimedia system. Facilities cover text to speech and voice recognition with audio streaming to play music files and radio, via a smart phone and Bluetooth. Fiat is particularly proud of building a range of cars with the lowest emissions in Europe. This is partially because they concentrate on smaller, more fuel-efficient, vehicles, but Fiat continues to strive for more. The 1.3 MultiJet model may have the least horsepower in the range, but it has excellent pulling power. So it proved very suitable to haul the 500L's larger body, offering the best combined fuel consumption and lowest emissions of the range. At 68.9 mpg and 107g/km you should be pleased with its performance hitched to a 5-speed manual gearbox, but the MTA automatic option beats these figures, slipping slightly over the 70 mpg line [72.4 mpg] and dropping the emissions figure to 104g/km. Servicing requirements are in line with Fiat practice with the MultiJet units needing attention every 21,000 miles. Similarly the warranty terms are industry standard on 3 years/ 60,000 miles, but the 500L may earn affection from owners on the residual front. The guidance is for a retention of some 37% over 3 years and 30,000 miles, but that could be a lot better than a heavily discounted Citroen or the cheapest Kias. Fiat bounced back to the top of its game with the million-selling modern-era 500 citycar and it was entirely logical for the company to want to extend that appeal to family customers with this 500L model, usefully enhanced in this revised guise. We like the way Fiat have injected some their respected imagination and original thought to the small MPV category which - let's face it - is cluttered with so many anonymous designs. Yes, there have been other manufacturers who have come up with stand out thinking - the open-doors on Ford's B-MAX spring to mind - but for us, only the Citroen Picasso matches the blend of style and practicality on offer in this 500L. Especially in 1.3-litre Multijet diesel form, this Fiat is a car likely to pick up a lot of conquest sales from the established supermini-MPV players. And deservedly so.